For the Uruguayan actor, see Daniel Hendler. 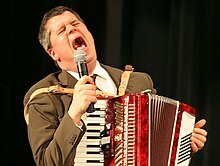 Daniel Handler (born February 28, 1970) is an American writer and musician. He is best known for his children's series A Series of Unfortunate Events and All the Wrong Questions, published under the pseudonym Lemony Snicket. The former was adapted into a Nickelodeon film in 2004, and a Netflix series from 2017 to 2019. Handler has also published adult novels and a stage play under his real name, and other children's books under the Snicket pseudonym. His first book The Basic Eight was rejected by many publishers for its dark subject matter. Handler has also played the accordion in several bands. Handler was born in San Francisco, California, the son of Sandra Handler (née Walpole) a retired City College of San Francisco Dean, and Louis Handler, an accountant. His father was a Jewish refugee from Germany, and he is distantly related to British writer Hugh Walpole through his mother. He has a younger sister, Rebecca Handler. Handler has been a voracious reader since childhood, and his favorite author was William Keepers Maxwell, Jr. He attended Commodore Sloat Elementary, Herbert Hoover Middle School, and Lowell High School. He graduated from Wesleyan University in 1992. He was awarded the 1992 Connecticut Student Poet Prize, which he claims was earned by ripping off Elizabeth Bishop. He is an alumnus of the San Francisco Boys Chorus. He is married to Lisa Brown, a graphic artist whom he met in college. They have a son, Otto Handler, born in 2003. They live in an old Edwardian house in San Francisco. Handler describes himself as a secular humanist and an atheist. In addition, he says, "I'm not a believer in predetermined fates, being rewarded for one's efforts. I'm not a believer in karma. The reason why I try to be a good person is because I think it's the right thing to do. If I commit fewer bad acts there will be fewer bad acts, maybe other people will join in committing fewer bad acts, and in time there will be fewer and fewer of them." Six of Daniel Handler's major works have been published under his name. His first, The Basic Eight, was rejected by many publishers for its subject matter and tone (a dark view of a teenage girl's life). Handler claims that the novel was rejected 37 times before finally being published in 1998. Watch Your Mouth, his second novel, was completed before publication of The Basic Eight. It follows a more operatic theme, complete with stage directions and various acts. Watch Your Mouth's second half replaces the opera troupe with the form of a 12-step recovery program, linguistically undergone by the protagonist. In April 2005, Handler published Adverbs, a collection of short stories that he says are "about love." It was followed in January 2011 by Why We Broke Up which received a 2012 Michael L. Printz honor award. Handler's novel, We Are Pirates is about a modern-age pirate who "wants to be an old-fashioned kind of pirate." It was released on February 3, 2015. His most recent novel, All the Dirty Parts, was published in May 2017 and "takes the blunt and constant presence of a male teen's sexuality and considers it with utmost seriousness". He served as a judge for the PEN/Phyllis Naylor Working Writer Fellowship in 2012. In 2016, he founded Per Diem Press, a poetry competition for young writers. He awarded $1,000 to three prize winners and published a chapbook with their work. Handler wrote the bestselling series of 13 novels A Series of Unfortunate Events under the Snicket pseudonym from 1999 to 2006. The books concern three orphaned children who experience increasingly terrible events following the death of their parents and burning of their home (done by a man named Count Olaf and his troupe of associates), and Snicket acts as the narrator and biographer of the fictional orphans. He has also narrated the audiobooks for three consecutive books in the series, before deciding to quit because he found it too difficult, handing back the narrating job to the original narrator, Tim Curry. From 2012 to 2015, Handler published the four-part series All the Wrong Questions under the name Lemony Snicket; the books explore Snicket's childhood and V.F.D. apprenticeship in the failing town Stain'd-by-the-Sea. He has also written other children's novels under the Snicket name, including companion books to his two Snicket series, and children's books such as The Composer is Dead and The Latke Who Couldn't Stop Screaming. Handler playing and singing at a reading of The End in 2006. Handler was in two bands following college, The Edith Head Trio and Tzamboni, but it wasn't until 69 Love Songs, a three-album set by The Magnetic Fields, that his music attracted attention. Handler played accordion on a number of tracks in 69 Love Songs. In the box set of the project, Handler provides a lengthy interview with band leader Stephin Merritt about the project, as well as conversations about each song. Handler also appears in the 2009 documentary Strange Powers, by Kerthy Fix and Gail O'Hara, about Merritt and the Magnetic Fields. He has gone on to play accordion in several other Merritt projects, including music by The Magnetic Fields, The 6ths and The Gothic Archies, the last of which provided songs for the audiobooks in the A Series of Unfortunate Events children's book series. On October 10, 2006, an album by the Gothic Archies was released with all thirteen songs from the thirteen audiobooks in A Series of Unfortunate Events, along with two bonus songs. In the audio commentary on the film adaptation Lemony Snicket's A Series of Unfortunate Events, Handler plays a song about how depressing it is to have leeches in a film. Daniel Handler wrote the lyrics to the song "Radio," performed by One Ring Zero, and the lyrics to "The Gibbons Girl" by Chris Ewen's The Hidden Variable. In 2017, Handler wrote the play Imaginary Comforts, or The Story of The Ghost of The Dead Rabbit, which was performed at the Berkeley Repertory Theatre. The satirical play follows the intertwining lives of three characters and is inspired by the grief Handler felt after the death of his father. Handler has also had some success in film work. He produced the screenplay for Rick, which was based on the Verdi opera Rigoletto, as well as Kill the Poor, which was based on the novel by Joel Rose. Handler was involved in the screenwriting process for the film Lemony Snicket's A Series of Unfortunate Events, but was ultimately removed from the project. He had completed eight separate drafts of the film before giving up following a change in those who were producing the film. Robert Gordon was hired to replace Handler and eventually received credit for the film's screenplay, under Handler's request. Handler did submit a commentary track for the DVD version, alongside director Brad Silberling. In character as Lemony Snicket, he derides the Lemony Snicket in the film – played by Jude Law – as an impostor, as well as choosing to play accordion and sing about leeches rather than pay attention to the film. At numerous times during the track he shows great sympathy towards the Baudelaire children, and implies that he is being held captive by the director in order to do the commentary. Handler was a writer on the Netflix series A Series of Unfortunate Events, also contributing lyrics to the show's theme song, which varies each episode. The show has won several accolades, including a Peabody Award in 2017 for excellence in Children's & Youth Programming. At the National Book Awards ceremony in November 2014, Handler made a controversial remark after author Jacqueline Woodson was presented with an award for young people's literature. Woodson, who is black, won the award for Brown Girl Dreaming. During the ceremony, Handler noted that Woodson is allergic to watermelon, a reference to the racist watermelon stereotype. His comments were immediately criticized; Handler apologized via Twitter and donated $10,000 to We Need Diverse Books, and promised to match donations up to $100,000. In a New York Times op-ed published shortly thereafter, "The Pain of the Watermelon Joke", Jacqueline Woodson explained that "in making light of that deep and troubled history" with his joke, Daniel Handler had come from a place of ignorance, but underscored the need for her mission to "give people a sense of this country's brilliant and brutal history, so no one ever thinks they can walk onto a stage one evening and laugh at another's too often painful past". In February 2018, Handler signed an online pledge to boycott conferences which do not have and enforce harassment policies. Underneath his comment, author Kate Messner recounted an incident in which Handler had made inappropriate jokes directed at her, such as "Are you a virgin, too?!" and "These children's book events always turn into orgies!" This led to many other women accusing Handler of verbal sexual harassment at book conferences; among the public accusations are stories of Handler telling a woman he had just met to kiss a random stranger, making crass comments to a teenage girl and walking off without apology when confronted, referring to a stranger as a "hot blonde" and making a "uni-ball" double entendre in front of young children. The incident is part of the larger Me Too movement. Handler apologised for his behaviour, saying that "It has never been my wish to insult any of my professional colleagues", "my sense of humor has not been for everyone", "as a survivor of sexual violence, I also know very well how words or behaviors that are harmless or even liberating to some people can be upsetting to others" and "I am listening and willing to listen; I am learning and willing to learn." Following this, students at Wesleyan University began to protest Handler's upcoming planned commencement speech at the university. In March 2018, Wesleyan president Michael S. Roth announced that Handler had withdrawn from the appearance, to be replaced by Anita Hill. Handler has published a variety of books under the name Lemony Snicket; this section lists works published under his own name. "A reader makes his way through one book by each Nobel Laureate." ^ Jeffries, Stuart (February 7, 2015). "Daniel Handler: 'How old does a child need to be to appreciate Lemony Snicket?'". The Guardian. Retrieved May 11, 2015. ^ Jeffries, Stuart (February 7, 2015). "Daniel Handler: 'How old does a child need to be to appreciate Lemony Snicket?'". The Guardian. Retrieved February 1, 2018. ^ "Lemony Snicket". The Wee Web. 2011. Archived from the original on September 27, 2011. Retrieved January 24, 2011. ^ Salamon, Julie (September 23, 2004). "Lemony Snicket's Down and Dirty Indie". The New York Times. Retrieved January 24, 2011. ^ Westbrook, Caroline (June 5, 2006). "Daniel Handler interview". SomethingJewish. Retrieved January 24, 2011. ^ "Daniel Handler: By the Book". New York Times. January 22, 2015. Retrieved May 11, 2015. ^ Sparks, Karen. "Daniel Handler". Encyclopædia Britannica. Encyclopædia Britannica. Retrieved May 11, 2015. ^ Handler, Daniel (June 10, 2007). "Adjusted Income". The New York Times Magazine. Retrieved August 15, 2014. ^ White, Daniel (November 20, 2014). "Lemony Snicket Pledges $1M to Planned Parenthood". TIME. United States. Retrieved April 27, 2018. ^ "CNN.com – Lemony Snicket reaches 'The End' – Oct 5, 2006". CNN. Retrieved April 30, 2010. ^ a b Bennett, Hayden (September 1, 2017). "'All the Dirty Parts,' by Daniel Handler". San Francisco Chronicle. Retrieved September 5, 2017. ^ Minzesheimer, Bob (October 11, 2006). "An 'Unfortunate' end". USA Today. ^ "We Are Pirates: A Novel". Amazon. Retrieved February 10, 2015. ^ "All the Dirty Parts". Bloomsbury Publishing. Retrieved September 5, 2017. ^ "2012 PEN/Phyllis Naylor Working Writer Fellowship". PEN American Center. Retrieved February 6, 2013. ^ "Daniel Handler spends a windfall on poetry". San Francisco Chronicle. Retrieved June 5, 2018. ^ "Tortuous Tales". A Series of Unfortunate Events. n.p. Retrieved 2012-04-16. ^ "Review: "Imaginary Comforts, or The Story of the Ghost of the Dead Rabbit" at Berkeley Repertory Theatre". OnStage Blog. Retrieved May 25, 2018. ^ "Down the rabbit hole with 'Imaginary Comforts' writer Daniel Handler". The Daily Californian. October 12, 2017. Retrieved May 25, 2018. ^ "Daniel Handler (a.k.a Lemony Snicket) explains why he's less involved with 'Unfortunate Events' on Netflix - The Boston Globe". BostonGlobe.com. Retrieved May 18, 2018. ^ "Here's What Went Into Making 'A Series of Unfortunate Events' Superb Theme Song". Decider. April 9, 2018. Retrieved May 18, 2018. ^ "Highlighting the Best Storytelling of 2017". Retrieved May 18, 2018. ^ Gambino, Lauren (November 20, 2014). "Lemony Snicket apologizes for watermelon joke about black writer at National Book Awards". The Guardian. London. Retrieved November 21, 2014. ^ Cohen, Anne (November 20, 2014). "Lemony Snicket's Series of Unfortunate Racist Jokes". The Jewish Daily Forward. Retrieved November 30, 2014. ^ Ohlheiser, Abby (November 21, 2014). "Daniel Handler does more than apologize for his 'watermelon' joke". The Washington Post. Retrieved November 30, 2014. ^ Woodson, Jacqueline (November 28, 2014). "The Pain of the Watermelon Joke". The New York Times. Retrieved November 30, 2014. ^ Frizell, Sam (November 29, 2014). "Jacqueline Woodson Responds to Racist Watermelon Joke". Time. Retrieved November 30, 2014. ^ "Award-Winning Author Jacqueline Woodson Responds To Racist Joke". The Huffington Post. Associated Press. November 29, 2014. Retrieved November 30, 2014. ^ a b c d Lockett, Dee (February 22, 2018). "Lemony Snicket Accused of Making Lewd Comments About Female Authors". Vulture. Retrieved March 13, 2018. ^ a b Perry, David M. (February 21, 2018). "HOW WILL PUBLISHING DEAL WITH LEMONY SNICKET AMID #METOO?". Pacific Standard. Retrieved March 13, 2018. ^ a b c Binkley, Collin; Italie, Hillel (March 1, 2018). "Author cancels graduation speech amid harassment allegations". The Washington Post. Retrieved March 13, 2018. ^ Madani, Doha (March 2, 2018). "'Lemony Snicket' Out As Wesleyan Speaker Amid Reports Of Inappropriate Comments". HuffPost. Retrieved March 13, 2018. Wikimedia Commons has media related to Daniel Handler.